The summer heat is here, and you know what they say, if you can’t beat ‘em, join ‘em. This year embrace the sweat, the sticky workouts, the dripping gardening sessions and the sauna that was once your yard. The only way around the heat is to keep on living like you don’t even notice it, and the only way to keep on living is to hydrate. Your body is 55-60% water, and that number decreases as the heat increases. To keep your active lifestyle flowing, you need more than a water bottle at your side. You need to hydrate with your food!Most of us know the standard summer foods that quench thirst in the body like watermelon, celery and cucumber, but there are many you probably haven’t thought about. The number one summer dish is salad! It’s the perfect time of year to indulge in salads because they’re cold, take very little time to make, can be a simple snack or an elaborate meal and nearly every crisp, cool veggie is in season. Did you know that leafy green lettuce is 94% water? The underrated iceberg lettuce has the highest water content of them all! Whether you prepare a traditional salad like Veestro's Roasted Beet and Kale or use lettuce creatively like the Kale and Quinoa Salad, you’ll be adding to your day’s water content. Oranges and grapefruits have about 90% water content by weight making them excellent morning boosters and midday snacks. Simply drinking the juice fills your system with sugar and no fiber to counteract it. Go old school and eat your fruit with your hands! These sweet treats will quench your thirst and provide a jolt of healthy vitamins. Squeeze a little lemon or lime into your water to make hydration tasty and alkalizing. If you're just not hungry, try Veestro's Spring into Action filled with pineapple and orange juice with a kick of protein powder! It’s not a picnic without melon! Watermelon gets a lot of attention for being a hydrating fruit. Its very name tells you this. But did you know that all melons have a 90% or higher water content by weight? There is something extremely wholesome about biting into a bright wedge of melon on a hot day with the juicy goodness dripping down your chin. The next time you spend a day in the sun, mix up a melon medley and enjoy all the flavors together with a little lime and mint. Broccoli and cauliflower, who knew? These two don’t get eaten for their juicy hydration, but they certainly help to hydrate the body. Cauliflower is 92% water by weight and broccoli is 91%. Not only do these two fill your system with much needed vitamins, fiber and potassium, they provide a very satisfying crunch to cold vegetable salads. If you’re not a fan of these two raw, try grading them or putting them in a food processor and then toss with some raisins, red onion, shredded carrot, lemon juice, slivered almonds, coconut aminos, then salt and pepper to taste. Or better yet, let us do it for you! Get the 21 Day Kickstart meal plan delivered to your door. Cool, fresh hydration done. It’s just too hot to eat. When the summer heat takes away your appetite, consider smoothies to beyour new best friend. A summertime favorite is half an avocado, 1 ½ cups coconut water, 1 cup frozen strawberries and two large handfuls of spinach. Keep a host of frozen fruits in the freezer and mix them with an equal amount of fresh greens. Don’t be afraid to mix in your vegetables! 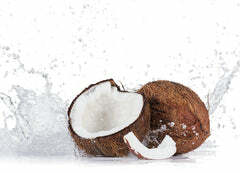 Blend smoothies with all natural coconut water for extra hydration benefits.